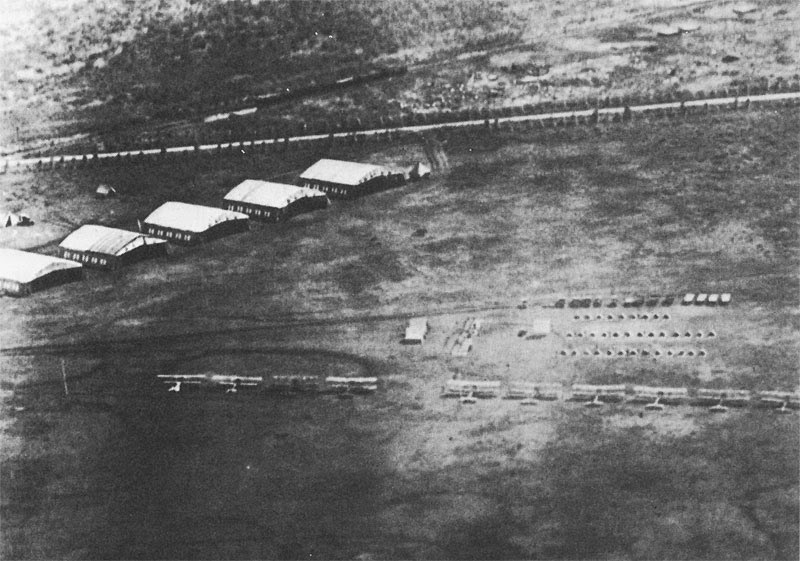 On February 6, 1922, under the direction of 1st Lt William T Agee of the 4th Squadron (Observation,) construction began on the old 17th Cavalry drill grounds at Schofield Barracks in central Oʻahu. With 20 men, he started clearing away trees and undergrowth. Within a month, they completed a landing strip. On November 11, 1922, it was named Wheeler Field in honor of Major Sheldon H Wheeler, former commander of Luke Field on Ford Island, who died in a plane crash on July 13, 1921. Permanent structures, including officers’ quarters and club, noncommissioned officers’ quarters and club, chapel, dispensary, and administrative buildings were erected in the early-1930s. During the 1920s and early ‘30s, Wheeler was the principal Army Air Corps field in Hawaiʻi. On August 5, 1939, the War Department issued General Orders No. 4 reassigning about 1,400-acres of Schofield Barracks land to Wheeler Field; less than four weeks later, on August 31 1939, it became a separate permanent military post. Three paved runways arranged in a triangle allowed for three aircraft to take off simultaneously. A separate, fourth runway was constructed later. A row of metal hangars and a flight line bordered the north side of the northernmost runway. A large reinforced-concrete enlisted men’s barracks and administrative buildings stood behind the hangars. By 1940, Wheeler Field had evolved into a primary base for Army Air Corps pursuit (“fighter”) aircraft such as the P-40 Warhawk, responsible for air defense of the Hawaiian Islands Territory. In the early morning of December 7, 1941, Japanese pilots flew toward the island of Oʻahu from six aircraft carriers (the Akagi, Kaga, Soryu, Hiryu, Shokaku and Zuikaku;) two waves of planes attacked various military installations on Oʻahu. The first wave of 183 planes (43-fighters, 49-high-level bombers, 51-dive bombers and 40-torpedo planes) struck its targets at 7:55 am. The second wave of 167 Japanese planes (35-fighters, 54-horizontal bombers and 78-dive bombers) struck Oʻahu beginning at 8:40 am. By 9:45 am, the Japanese attack on Oʻahu was over. Air bases were important objectives in the attack, because the success of the Japanese was dependent on eliminating air opposition and precluding US planes from following their aircraft back to their carriers. The first air base to be hit was Wheeler. There, twenty-five dive bombers aimed at the hangars, dropping approximately thirty-five bombs. They hit and set fire to hangars and storehouses. One bomb struck the barracks. The same planes returned to strafe the flight line. Casualties amounted to thirty-eight enlisted men killed and fifty-nine wounded. Eighty-three aircraft had been destroyed, fifty-four of which burned in the fire storm on the flight line. During World War II and until 1949, Wheeler was assigned to the Seventh Air Force (former Hawaiian Air Force) and successor commands. The following year, the installation was placed on minimum caretaker status; however, with expansion of the Air Force during the Korean conflict, Wheeler AFB was restored to fully operational status in 1952. In August 1987, the Secretary of the Interior designated Wheeler AFB as a National Historic Landmark, recognizing it as a site of national significance in the history of the United States and, in particular, World War II in the Pacific. The image shows Wheeler Field, before completion of permanent hangars (circa 1922-1923.) In addition, I have added other images in a folder of like name in the Photos section on my Facebook and Google+ pages.